We manufacture beer and that’s just awesome. What’s better – we brew damn good beer. Drinking beer at the brewery where it was made doesn’t get better. Beer that was brewed from the finest ingredients available, in small batches, which allows the brewers to keep a close eye on quality and precision, then follows a perfectly executed transfer and fermentation process, to then travel just a few feet away to your glass is, well – nirvana. Do this over and over and you’ve got the Northwinds draft line-up. We operate a 15 barrel brewhouse on-site. What does this mean? It means that each time we brew a beer we brew to approximately 15 barrels or 465 gallons or 1,760 litres, which is 17.6 hectolitres. It never actually ends up at this volume so generally, we brew 1,500 to 1,600 litres of finished beer per batch. This is what’s considered a microbrewery and we are quite micro vs. production craft breweries and the ‘other guys’, which we won’t mention. It’s not a lot of beer per batch but it’s a perfect number for what we’ve set out to do. We sell the majority of our beer on-site in our brewpub and the beer goes quickly. We have a 16 faucet draft system, which includes taps for our guest beer(s) and cider(s). We ensure there is a wide range of styles available at all times. From light (in colour) to dark beers, low alcohol to high, a variety of yeasts, ales and lagers and really fun beer styles throughout. As a beer manufacturer, we also have a take-home Beer Store, located on-site, adjoining our restaurant. We sell a rotating number of beers in a 650ml capped bottle and a 1.89L refillable glass growler. In our Beer Store we keep a wide range of offerings, so often we have 6-8 bottle varieties and 4 growler varieties, so 10 different beer styles available at any given time. Not bad. We also sell to some great bars and pubs. We do not sell through the LCBO or The Beer Store. Could this be an outlet in the future? Possibly. For now, we’re happy with our focus and we’re having fun. Production brewing and the plague of distribution and mass volume is an animal unto itself and we’re not going there right now. The beer side of the company opened a year before the restaurant. September 2013 was our first public beer launch – Corduroy Rye IPA. Fantastic brew. Since then, Northwinds has created an incredible 40 beer styles. Our brewery is shiny, impressive (for such a small space) and filled with talent and good beer. Come drink some. After five years of brewing for some of the big boys in the brewing industry, and another 5 at Creemore Springs Brewery, the opportunity to get back to brewing at its most genuine level was something that Bryan couldn’t pass up. The opportunity to get creative with beer, using an expansive range of styles, and all only 3 blocks from home was what he was looking for. We’re happy he came calling! With a degree in Food Science and diplomas in both brewing and beer packaging, as well as work in breweries ranging in size from 1,000 litres to 67,000 litres per brew and roles covering brewing, packaging and product development, he has all the tools needed to continue the Northwinds tradition of dazzling our customers with new and innovative styles, as well as maintaining production of the styles everyone has come to know and love already. When he isn’t toiling away in the brewhouse you can find Bryan at the hockey rink, still waiting for the pro scouts to show up. Northwinds is a proud member of the Ontario Craft Brewers Association. 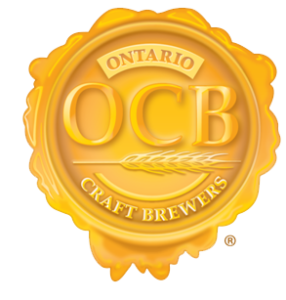 The OCB is a group of over 50 brewers dedicated to making great tasting beer in Ontario. The members of the OCB promote fresh, natural, quality beer and collectively commit to a standard of excellence in the beer making process. As a member of the OCB, we are committed to following an honoured brewing philosophy. Northwinds serves 10 to 14 of our own beers and have rotating guest taps showcasing other craft brewers.